There are signs of new life. The garden is stirring. Slowly waking up. Responding to the increase in day light and warmer weather. Bright yellow-green shoots emerging from the subterranean world. I have yet to clear the garden from this Autumn-Winter. I leave the flower stalks and dead leaves until early Spring. The dried flower heads leave something for me to look at, some seeds for birds and somewhere for insects to over-winter. The Chives will be coming out of their pots later this Spring and will be used as part of the Edible Edging I have planned in the garden. Bronze Fennel makes a wonderful border plant, the frothy fronds will give a leafy backdrop to flowers in the borders. The garden Mint in a pot needs transplanting to something much bigger, maybe the old earthen ware sink would be perfect. 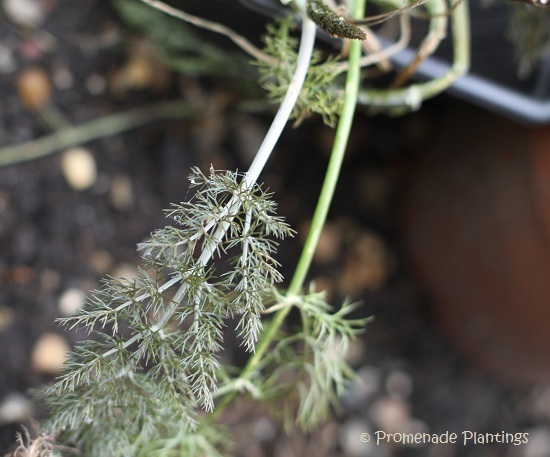 Another herb for the Edible Edging, the Curly Parsley has survived the winter well, putting on new growth. These plants will do well again this year, but I must remember to plant more for next. The Rosemary seems confused, in flower and it’s only February. Or maybe it’s “stressed” in the pot and needs some much needed TLC. 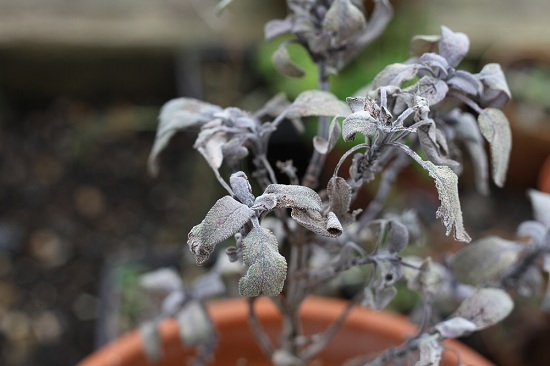 The Purple Sage is looking ragged, but it has survived the winter, and will perk up with warmer drier weather. Sorrel, not strictly a herb I know, but his red veined variety is stunning. I must get round to transplanting it soon. A Purple Artichoke that will find a permanent home on the allotment, it will be at least another year before I get to sample its wares. 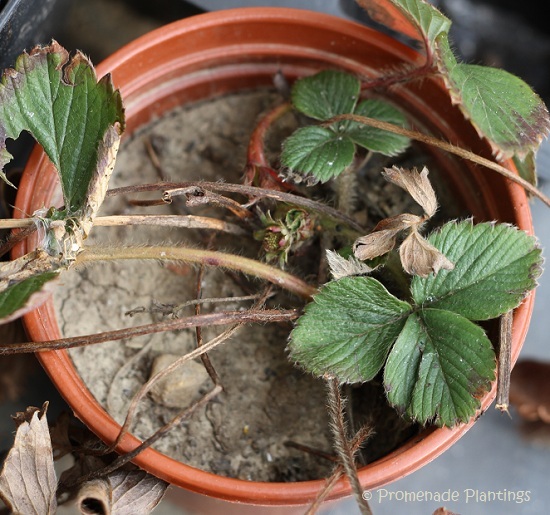 A few Strawberries in pots need re-homing on the allotment too. I look at the new growth and dream of sweet sunshine juicy fruit. So much to do, so many seeds to sow, including the summer herbs of Coriander, Basil and Tarragon, there is plenty of re-potting and planting out, but for now I can content myself with looking at the new shoots. great post and AMAZING photographs! your whole blog is fantastic, so inspiring! That’s a photo series to warm a gardener’s soul! 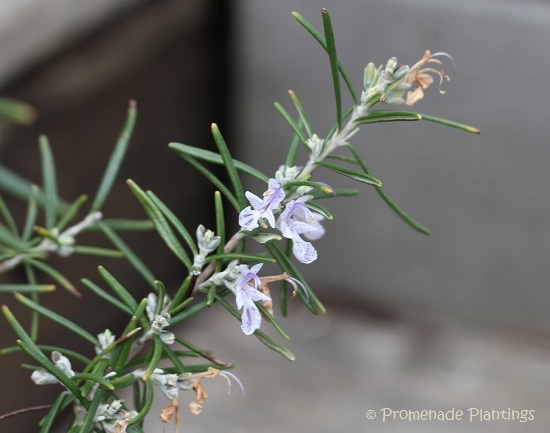 I wouldn’t be too worried about the rosemary…my outdoor ones bloom as soon as they start getting enough sunlight hours. thanks Marie that’s good to know about the Rosemary, I’ve never seen one bloom so early! So impressed by all your fresh herbs. You’ll be in a bounty come spring! Hi Celi, yes they are all outside, thoroughlly pot bound and root bound, the dreadful neglectful gardener that I am. They sit on the terrace come rain, snow or whatever the weather throws at them. The garden is reasonably sheltered and sunny as it’s walled and we rarely get major killing forsts here, they are more likely to rot and die from wet and cold over winter. The awakening of a sleeping garden is such a wonderful sight as it unfolds. The activities start slow and as you mention – the days get longer, the air and soil become warmer – before you know it the garden leaps into production. It is an amazing thing to witness. Isn’t it amazing, year after year I still marvel and wonder. Yes sometimes there are plants that don’t make it, but that’s natures way of saying Claire, plant something else, get a cutting from somewhere else, try something new! 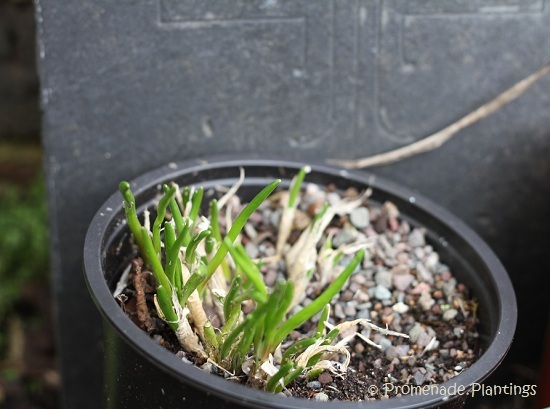 We´ve been cutting back plants today as we too leave many of them to die back completely…many are sprouting already. That sorrel is so beautiful, it´s not a plant I´m very familiar with. It’s a good feeling to get in there are start clearing up isn’t it! 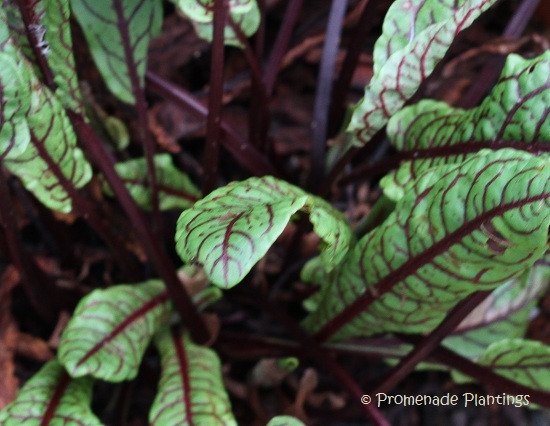 I’m no expert on Sorrel, except that it’s very hardy, pretty and nice as young leaves in a salad. I need to experiment a bit more and cook with it. I also think I need to divide that plant up, but I’m not so sure about that! Yes I’ve had Sorrel soup years ago, and if I remember right you need loads, it’s a bit like spinach in that way, and also for some reason I seem to think it isn’t the most attractive colour when cooked, but I could be wrong…. I think your herbs did an exceptional job surviving the winter – I have only seen the green sorrel before – love the red one. Does it has the same lemony zingy taste? I did have some green sorrel up on the allotment but it died on me, this one I picked up at a plant sale/fair, I took one look at it and thought oooo I want that! And yes it does have a sort of zingy taste, I actually need to go and sample it again to remind myself!! Good to see your garden awakening! It means that ours won’t be far behind. An edible border is such a great idea. I hope you’ll share pictures of it later in the season. Our weather is in a state of flux right now. Snow yesterday and tomorrow will hit 50*. I hope to be able to get into the garden mid-week and start the process. Fingers crossed! Hi John, that is certainly a mixed bag of weather you are having. It’s warmed up here and across Europe, although who know ho wlong it will last! and yes I’ll certainly take some photos of the edible border, hopefully it will work, you know the scenario where you have an idea in your head but to actually put it into practice and for it to work is yet another thing! Your mint and chives look about like my mint and chives, which I maintain year-round in pots. My chives are perhaps a little taller. 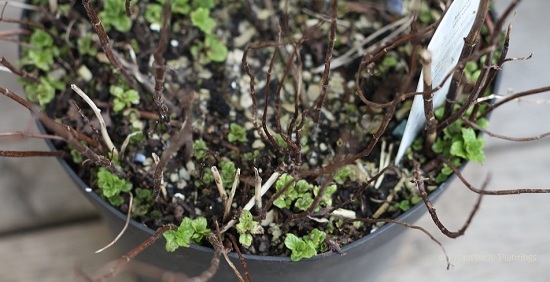 My mint can probably use a transplant, or at least an untangling of roots. Meanwhile one weird tomato plant never died off with the rest and produces about three cherry tomatoes a week — it’s been going since May or June: it gets heat from a black garage door and sun reflected from the white wall behind it. Not a thing of beauty, but I can’t pull it up while it is producing. That is a weird tomato! Have you saved some seeds from it, I mean it might not look very attractive right now, but it might be worth trying to keep going again next year. Mind you, nature can be very akward in that when you want something to happen nature stubbornly refuses to play ! You know, I’ve been thinking I should save the seeds — I’ve just been putting it off because I’ve never done it. You sure that’s Sorrel? Looks like Beetroot to me! Lovely photos there and I like the imaginative use of pots, I’m a believer in use, re-use, re-use ad-infinitum! Usually this time of year my garden would still be buried under snow, but we’ve had an incredibly mild winter and just this week I noticed some of my herbs are coming back to life too. I did miss the snow this year, but I won’t complain about an early spring! 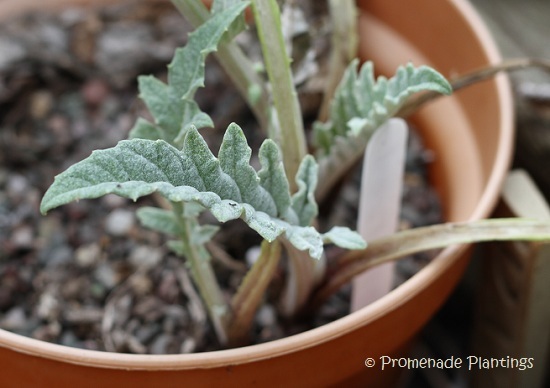 Love your photos – I’m feeling attached to your herbs and other edibles! nice to see signs of life and renewal from the garden, even now in winter. Given it’s still winter, you sure do have a lot going on in your garden. But I guess it’s just a few more days and it will be Spring. Looking forward to seeing what develops from here. The daffodils started poking their tips out just before the big freeze but were a bit early. I hope they’ll be ok. I didn’t get a chance to peak at my garden before I left but I hope it’ll be as promising as yours! Yes the daffs have started to make a break for it, and the tulips have started showing signs of life too! Ooo you are off, somewhere lovely I hope?! This perks me up for spring planting! In my zone, the cilantro is still growing (it overwintered well), as are my perennial herbs. 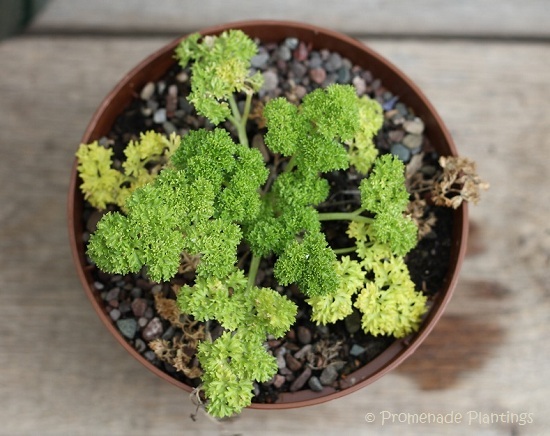 The parsley that reseeded itself is even growing here. I’m always amazed each year when you see the first shoots of green coming out of the ground, especially in our Maine garden which is in zone 4. Much later than now but there is always the anticipation of spring when there is a little warmth in the air. I hope you can post before and after shots of these spring babies!! Just a bit of tender loving care and warmer weather and they will all be healthy and big!! I do so miss the Spring from up North, I hardly see any seasons where I live! ‘ve often wondered what it would be like to live somewhere without distinct seasons, I guess the changes are more subtle? Exciting to see your plants coming to life!!! Isn’t it! Let’s hope they make it through!! Oh, all this green newness is welcome indeed! You will have a beauty of a garden–well, two, with the allotment! I love the Edible Edging you’re doing. And that sorrel really is a stunner. I’m a great admirer of showy leaves, and when they’re edible as well, it’s a marvelous bonus. I’ve no idea if the edible edging will work, but its a way for me to sneak veggies into the garden, besides you need to have herbs handy for the kitchen right? !